Rancho Cucamonga, CA – January 9, 2013 – Retail thieves will strongly avoid merchandise protected by the new Scout X400 public view monitor (PVM) with a built-in DVR from Universal Surveillance Systems LLC (USS), the architects of surveillance technology. The rugged, advanced unit features a 9.7-inch vivid video screen and multiple new innovative tamper alarms that allow eye-level mounting to record activity from the optimum vantage point offering a strong, visible deterrent to thieves. "With the growing incidence of retail theft, particularly organized retail crime, video surveillance utilizing PVMs has become an increasingly important theft deterrent," said USS President and CEO Adel Sayegh. "Much like a vigilant guard, the Scout X400 PVM will watch over merchandise, and, mounted at eye-level in an aisle or at a check stand, the sharp image on the bright screen sends a clear message to would-be thieves that they are being monitored. The eye-level positioning also optimizes its ability to clearly view and record faces. Additionally, its alarm will let you know immediately if anyone attempts to obscure the camera, reposition the monitor, cut the power cable or open the unit." The Scout X400 features a crystal-clear public view CCTV monitor in a heavy-duty commercial-grade case, WDR camera, multiple tamper alarms and digital signage capabilities to display messages to customers for marketing and other purposes. 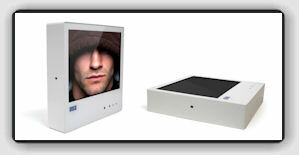 The monitor can also be used to display video messages or advertisements triggered by the unit’s built-in motion detector. The Scout X400 is perfect for reducing product theft at retail store product gondolas, end caps, checkout counters and aisles where expensive or frequently stolen merchandise is displayed. For more information, click here or call 1-800-488-9097.